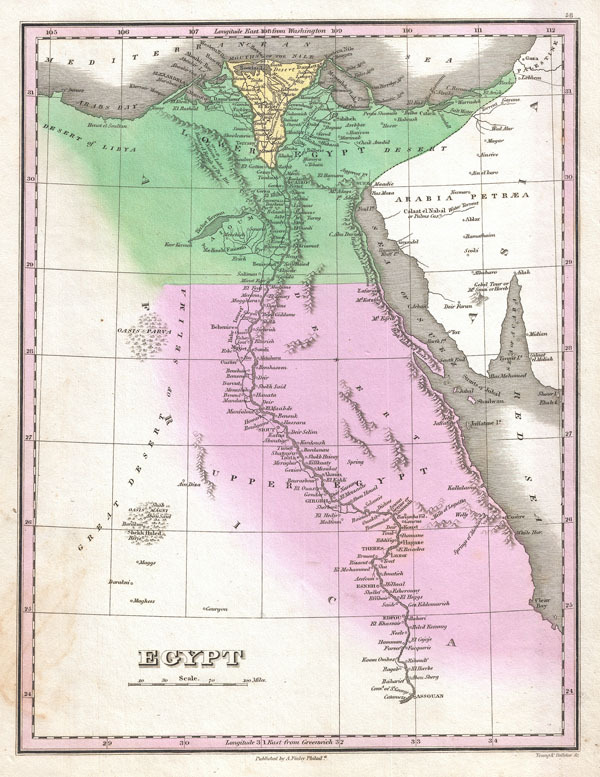 A beautiful example of Finley's important 1827 map of Egypt. Depicts Egypt, centered on the Nile River, and extending south as far as Aswan. Names numerous settlements and villages along the course of the river, including a number of temples and ancient Egyptian ruins. Also identifies several desert Oases including Parva (Kharga?) and Shekh Huled (Dakhla?). In the Sinai Peninsula, a mountain labeled 'Gebel Tour, Mt. Sinai or Horeb' is drawn. Title and scale in lower left quadrant. Engraved by Young and Delleker for the 1827 edition of Anthony Finley's General Atlas.